Before my son with type 1 diabetes started school, my husband and I had to think about our options for handling lunchtime at school. Do we have him eat the school lunch and leave it up to him and the nurse to calculate the carbs in the meal each day? Or do we pack his lunch for him so that we have a bit more control over the nutrition, balance, and carb breakdown of his meal? We ultimately chose the latter, and I have packed my son’s lunch every day since. This has worked well for us over the years, but it’s definitely easy to get stuck in a rut where you feel like you’re making the same thing day in and day out. So if you’re like me and need a little inspiration to get you thinking outside the lunchbox, check out the recipes for this school-day meal that I like to think is a little more creative than your average ham-and-cheese. I’ve included a delicious main dish, a fresh and light side dish, and my son’s favorite lunchbox dessert. It’s all kid-friendly but delicious enough for adults — so pack yourself a box too! 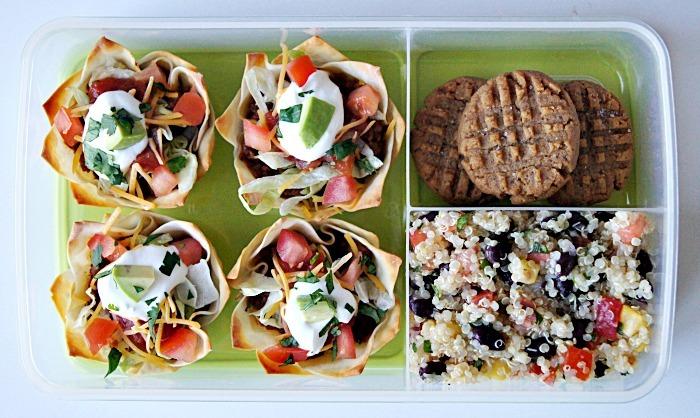 These bite-size tacos are the perfect way to spice up your kiddo’s lunch and get you both out of the sandwich rut. Letting the kids pick their own favorite taco toppings makes them even more fun. My kids enjoy these at room temperature, but if your child will only eat them warm, just send them in a thermos that’s been preheated. These delicious, protein-packed cookies have become a lunchbox staple for my son over the years. They’re the perfect dessert to top off your kiddo’s lunch without setting off a blood sugar seesaw.